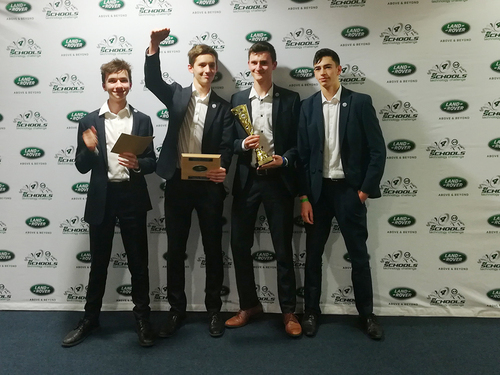 A team of aspiring engineers from King Edward’s School, Bath - known by their team name as ‘Fractal 4x4’ - has won the South West Regional Final of the Land Rover 4x4 in Schools Technology Challenge, securing themselves a place in the UK National Final in March. The Land Rover 4x4 in Schools Technology Challenge is one of the world’s best project-based STEM challenges and culminates in a World Final. Students work in small teams to design and build a Land Rover of the future to specifications set by real Jaguar Land Rover engineers. Participating teams build a radio controlled 4x4 vehicle which must successfully navigate and complete obstacles on an off-road test track that is just as demanding as the real thing, emulating the capabilities of a full size 4x4 vehicle. The winning King Edward’s School Fractal 4x4 team, who won an additional prize for best engineered vehicle, were joined in the South West Regional Final by a second King Edward’s School team, called ‘Modulus’ who also won recognition from the judges and gained an award for best Research and Development. The South West Regional Final took place at the Flybe Training Academy near Exeter. During the regional heat the King Edward’s School teams had to demonstrate an in-depth knowledge & understanding of their vehicle’s suspension, chassis and wheels. The day involved a verbal presentation and engineering interview ahead of testing their vehicle on a demanding obstacle course. The Land Rover 4x4 in Schools Technology Challenge aims to raise awareness, interest and enthusiasm in engineering through the practical application of Design & Technology, Mathematics and Science. The Challenge's organisers, Land Rover, also encourage teams to identify sponsors and partners to support their project and the winning King Edward’s School Fractal 4x4 team were delighted that Sitec and the University of Bath were among their mentors, as well as Refil, makers of recycled 3D printed filament and cloud-based service providers, ServiceNow. The winning King Edward’s School ‘Fractal 4x4’ team comprises: Alex Christopherson, Morgan Jones, Xavier Raynes and Finn Williams who will be heading to the National Final at The British Motor Museum in Warwickshire on 6 and 7th March 2019.